DALLAS – Everyday Americans can give troops deployed overseas a taste of home this Fourth of July with an Army & Air Force Exchange Service gift card. 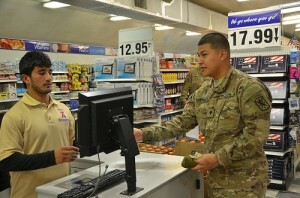 Gift cards that can be redeemed through the Department of Defense’s largest exchange service can be sent to Soldiers, Airmen, Sailors and Marines deployed to Afghanistan and other contingency locations worldwide. Service members can use the cards to pick up a variety of morale-boosting items including electronics, magazines, movies, food and cold drinks. While only authorized military shoppers can redeem Exchange gift cards, any American can send one by simply logging on to http://www.shopmyexchange.com/Community/supporttroops/. From there, Exchange gift cards, ranging in values from $10 to $500, can be addressed to a specific Soldier, Airman, Sailor or Marine or sent to “any service member” through the Fisher House Foundation, Air Force Aid Society, Warrior and Family Support Center or Navy-Marine Corps Relief Society. The Exchange operates facilities for service members, retirees and their families in more than 30 countries, 50 states and five U.S. territories. Current operations include 131 main stores, 174 Military Clothing facilities, 72 movie theaters, 850 specialty stores and 1,590 quick serve restaurants such as Taco Bell, Popeye’s and Starbucks. For more information or to schedule an interview with an Exchange representative please contact Conner Hammett, 214-312-4566 or hammettc@aafes.com. This entry was posted on Monday, June 30th, 2014 at 11:47	and is filed under Press Release. You can follow any responses to this entry through the RSS 2.0 feed.